Youtility is marketing so useful, people would pay for it if you asked them to do so. This form of helpfulness is transforming the businesses of companies large and small all over the world. Youtility is perhaps most effective, however, when applied to industries where there is not a lot of natural differentiation between competitors. One such industry is real estate, where we often think of Realtors and property managers as homogenous entities that all do, act, and say similar things. That’s why I co-wrote Youtility for Real Estate: Why Smart Real Estate Marketing is About Help, Not Hype. This is the playbook for how real estate professionals can massively accelerate their business by fundamentally shifting how they think about value, their customers, and their marketing. The book launches tomorrow (November 4) and is available at Amazon.com and BN.com as an electronic download for the spectacularly reasonable price of $2.99. I wrote this book with the sublime Erica Campbell Byrum, head of digital marketing for ForRent.com. Erica is a brilliant marketer who has successfully applied the Youtility principles to her own business. If you’re in real estate, purchasing this book for less than 3 bucks is a no-brainer. But I’ll tell you a secret: this is the best thing I’ve ever written. 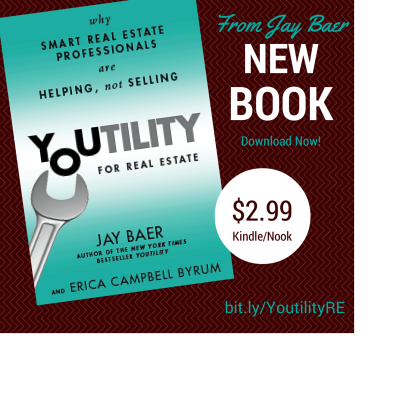 Even if you aren’t in real estate, you will find huge value in this book, I promise. In fact, if you buy a copy of Youtility for Real Estate, and you don’t love it, just let me know and I’ll refund your money in full. Here’s a taste of the kind of interesting examples that are in Youtility for Real Estate. When all your marketing and communication efforts are focused on real estate, your only potential audience for that information is the small sliver of the population currently thinking about buying, selling, or leasing a property at any given time. You need to create useful marketing that appeals to customers at ALL stages of the funnel. At the top of the funnel (sometimes abbreviated as TOFU) are potential clients who are not likely to be “in the market” yet in a classic sense. They may be receptive to buying, selling, or leasing, but haven’t taken steps that would indicate that they are active in the market. For most real estate professionals, this group—which is by far the largest—is invisible and off-limits because most real estate marketing has nothing to offer this category of potential client. At this stage, these clients are primarily interested in information about communities, regional amenities, and lifestyle optimization in general. Youtility at the top of the funnel increases your potential customer base by being helpful beyond real estate. 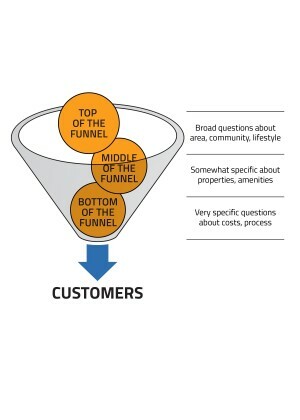 The middle of the funnel (MOFU) is where most real estate marketing is focused. At this stage, the potential client needs information about what’s available, where, and how it all compares. This is where listing aggregators, search engine optimization, online inquiry forms, and similar tactics become commonplace. Once a potential client has expressed interest in the market (often through a search or website visit), literally dozens of real estate professionals have similar information available. The best marketers at this stage go well beyond listings and provide true expertise in an easy-to-access fashion that’s sometimes assisted by remarkable technology. The bottom of the funnel (BOFU) is where decisions are made and ratified. This is where potential clients decide between two or three real estate professionals and are looking to have specific questions satisfactorily answered, including inquiries about costs, fees, and process. This is also the stage where trust building through Youtility becomes incredibly important, especially given the disproportionately high psychological and financial stakes inherent in real estate. The Corcoran Group is one of the largest residential real estate brokerages in New York City. Historically, conventional wisdom has suggested that luxury buyers are not as active on social media and still prefer analog, high-touch real estate processes. In recognizing the changing demographics of luxury buyers, and the true pervasiveness of social media across all population groups, the Corcoran Group turns the “social media doesn’t work for luxury” axiom on its ear. One of the top-of-the-funnel Youtility programs the Corcoran Group offers is a large collection of neighborhood-centric tips and lists on Foursquare. Social media specialist Bari Mogill and her colleagues have left thousands of tips about New York City that are digitally “attached” to specific locations. When residents use the Foursquare app to check out a location or look for things to do in the immediate vicinity, tips from the Corcoran Group pop up inside the app. To promote these lists and provide friend-of-mine awareness at a low cost, the Corcoran Group has built an ingenious system using the firm’s Twitter account and IFTTT recipes. Holli Beckman is vice president of marketing and leasing operations for WC Smith, a real estate developer and property management firm that oversees more than ten thousand units in the Washington, DC, region. Holli also owns Apartminty, an apartment-hunting consultancy that helps locate apartments for clients across the United States. Holli writes a comprehensive and useful blog about all things apartments. She knows the apartment-locating business and realizes that it’s far from easy. Recognizing that if people were taking the time to complain about apartments on Twitter, their need was both acute and present, Holli set out to take as much pain as possible out of the process, and within thirty days she generated more than one hundred leads for Apartminty, all from Twitter. After twenty-three years in real estate—the only job he’s had outside of time spent as a U.S. Army Airborne Ranger—Joe Manausa has learned a few things about how people think about buying and selling properties and about the power of self-serve information and Youtility. One of Joe’s most successful Youtility programs is a downloadable PDF e-book called For Sale by Owner: How to Sell Your Home Yourself. Joe takes the time and effort to produce a comprehensive guide that will help people sell their house without his assistance. It’s a very counterintuitive approach that most real estate professionals wouldn’t even consider, much less execute. But Joe realizes that this type of Youtility builds all-important trust by demonstrating that he has nothing to hide. Further, he actually generates new clients directly from this program. 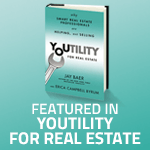 Purchase your copy of Youtility for Real Estate today (for less than 3 dollars!). Or, you can gift it to a friend with just a click or two on Amazon.com. And remember, even if you’re NOT in real estate, if you buy the book and don’t find value, I’ll give you your money back out of my own pocket.